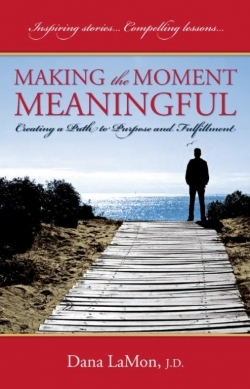 Making the Moment Meaningful is a fascinating book for any number of reasons, not the least of which is its author. Dana LaMon overcame a disability (he became blind at a young age) and rose above prejudice (he is African-American) to achieve significant success. He received his undergraduate degree from Yale University and a law degree from the University of Southern California. He served as a judge for twenty-nine years, and is now a sought-after motivational speaker. LaMon doesn’t dwell on his personal background, however. Instead he shares what he has learned in his own life and through the experiences of others in a work that is elegantly written and powerful, yet easy to read and understand. The book is divided into eight parts: What Life is About, Promoting Growth, Establishing and Nurturing Connection, Discovering Purpose, Defining Yourself, What Gets in the Way, The Commitment to Meaningfulness, and The Satisfied Life. Each contains short, pointed chapters designed to teach, motivate, and inspire. Many of the chapters begin with a relevant proverb to set the tone for the content. Each chapter also puts forth a compelling question or two, along with answers that encourage the reader to reflect on his or her own life experiences. In posing such questions as, “Are you spending the majority of your life on the things that matter most to you?” and, “Is your soul satisfied?” LaMon addresses the deepest needs humans have, focusing the reader on meaningfulness, purpose, and fulfillment. LaMon carefully leads the reader through self-examination and assessment rather than being judgmental. He also weaves into the text numerous stories about others that reinforce and validate key concepts and bring relevance to his writing. With Making the Moment Meaningful, LaMon has achieved something very rare: He has managed to discuss some of the biggest questions in life while writing in a clear, concise, and comprehensible voice. He lays out the concepts and choices, and leaves it up to the reader to determine the best way to proceed. If Dana LaMon’s own life is any indication, following his guidance is sure to be of lasting value.